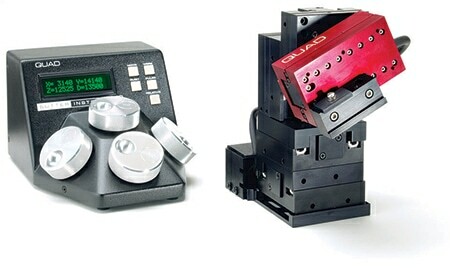 QUAD, the newest Sutter Instrument motorized micromanipulator, is easy-to use and features four independent axes. Three axes provide the X, Y, Z-orthogonal motion typical of most motorized micromanipulators. In the QUAD, Sutter introduces a true fourth axis to move the electrode coaxially at exactly the desired angle of approach. The X, Y and Z axes have a 25 mm range of motion, and the fourth, diagonal axis, has 30mm of travel to significantly extend the reach of the system. The QUAD is very easy to operate. The compact design takes up minimal bench space, has ROE control, a digital display of position, is fan free and intuitive to use. ROE inputs for each axis allow facile manual control of electrode position. Five conveniently located buttons control all of the basic functions that you will need in normal operation. Press and hold the Work button to quickly store a work position; press Work again and the manipulator will return to the same location. Home sends the manipulator to an initial location or any user defined position, which is useful for changing electrodes rapidly. When you are ready to begin collecting data the motor drive electronics can be suppressed by pressing Quiet. Display coordinates can be zeroed at any location by pressing Relative; go back to absolute coordinates by pressing Relative again. Finally, Pulse activates a pulse movement mode that produces small, rapid bursts of motion that can be advantageous for sharp electrode cell penetration. All of the electronics, except for a small power supply, are inside the QUAD controller. Sutter has achieved this space savings by using high frequency current switching to regulate motor output. Switching technology allows us to put a four-axis stepper motor controller in a small box with no fan. In some experiments we expect users may detect a bit of high frequency electronic noise (compared to our standard linear controllers). However, once the pipette is in place and the Quiet mode activated this noise is eliminated. The Quiet mode also locks out the ROE input to avoid any accidental motion due to touching the ROE. In Quiet mode, the LED display turns red to indicate that the ROE knobs are inactive. In keeping with the compact, easy to use controller, the QUAD has no computer connections. Users who need a controller with computer connectivity or a controller that can be used to generically control a range of stepper motor devices are encouraged to use the industry standard Sutter MP-285 or the MPC-200 controllers.